While it’s useful to have some local currency ready to use at your destination, it’s a good idea to try minimise the amount and not have the bulk of your spending money in cash. ATMs and credit card payments are readily available in many countries around the world and this means peace of mind of not having to worry about theft or misplacing currency. Most travel insurance policies also only cover a small amount for theft of cash. The exception is if you’re travelling to parts of Africa and Asia where international ATMs are harder to find, or if you’re off to Argentina where you can potentially get a better deal on their local currency (pesos) by taking US dollars and exchanging using the ‘blue dollar’ rate. When exchanging money, shop around for the best deals and work out how much the bank or exchange store is taking from you. You can work this out by looking at any upfront fees and the difference between their advertised rate versus the mid-market rate. Analysis from Choice found that the major banks offered rates up to 5.3% worse, meaning you’re getting less foreign currency for every dollar you exchange. It’s also best to avoid buying currency at the airport. The currency exchange counters at airports generally offer horrendous exchange rates which can be up to 15% higher since they know your options for conveniently exchanging money are limited. Most financial institutions charge extra when you transact in a foreign currency but there are ways to minimise this. There are 2 things you can do to minimise fees you pay when using your credit card overseas. Always pay for your credit or debit card purchases in the local currency rather than Australian dollars to avoid the cost of dynamic currency conversion. Dynamic currency conversion (DCC) refers to when you are offered the “convenience” of paying in Australian dollars at the point of sale but in reality are charged an additional 3 to 5% in conversion fees (above the typical Visa or Mastercard fees). Because you’re still purchasing from an overseas merchant, you’re likely to still be charged the usual overseas transaction fees associated with the purchase. This fee rort is taking additional money from you by the merchant’s bank, which is often shared with the merchant. Westpac’s website actually advertises to merchants that “Westpac DCC can generate a new revenue stream for you – paid monthly in arrears” to “maximise your revenue potential”. It’s worth mentioning your dissatisfaction to the shop when you are offered DCC so they are discouraged from offering this rip-off. Look into credit cards like 28 degrees and Bankwest Zero Platinum MasterCard with zero annual fees and foreign transaction fees for purchases. This means you can avoid paying the 3% currency conversion fee attached to most VISA and Mastercards (3.5% on American Express), so the bank won’t be able to make $30 from you every time you spend $1,000 during your trip, like paying your hotel bill. Most banks charge a $5 withdrawal fee every time you use an overseas ATM on top of currency conversion fees – that works out to be an $11 fee for a $200 withdrawal. You can get around paying overseas withdrawal fees if you’re a Westpac customer using their ‘Global ATM Alliance’ in selected countries around the world (the 3% foreign transaction fee still applies) or with Quay Credit Union which offers 10 free overseas withdrawals per month with a 2% currency fee. The best option I’ve found is the Citibank Everyday Plus account which offers free overseas withdrawals and no currency conversion fees. You can find the best deals on flights by being flexible with travel dates and shopping around with online travel engines and airline websites. If you have a shortlist of places you want to visit, keep an eye out for sales from airlines that fly there as you can save a few hundred dollars. Something else I’ve discovered is that it can be cheaper to book flights via an overseas website even with the currency conversion. For example, the same Sydney – London return flights on the same day was over $200 cheaper on Expedia’s UK website compared to their Australian site. If you end up using an airline or hotel that offers a free loyalty programme, it’s a good idea to join to enjoy additional benefits from your trip. 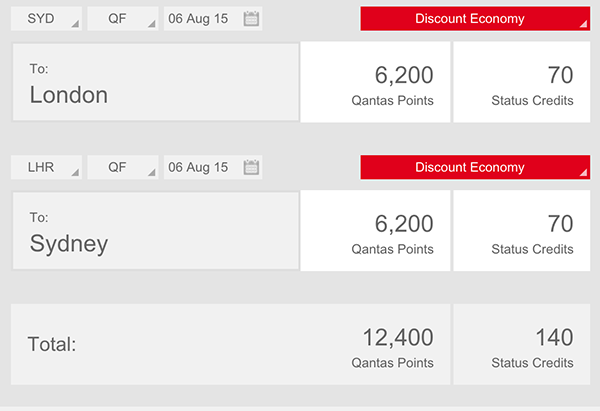 As an example, a holiday to London flying ‘discount economy’ on Qantas can earn 12,400 points, which is enough points to redeem a one-way ticket from Sydney to Melbourne for 8,000 points or a $50 gift card at David Jones for 7,400. Joining an Australian programme can be better than an overseas one as they provide more ways to earn and use points, like at the supermarket or petrol station. Virgin Australia’s Velocity programme is free to join and the fee for Qantas Frequent Flyer is waived if you join via Woolworths’ Everyday Rewards. Because both airlines have a network of partners, it means flying on airlines like Eithad, Air New Zealand, Delta and Singapore Airlines can earn you Velocity points and flying on Cathay Pacific, British Airways, American Airlines, Japan Airlines, Finnair, LAN, Qatar Airways, Fiji Airways and Emirates can earn you Qantas Points. Another programme that I take advantage of is Hotels.com rewards. They often have good deals and the ability to earn a free night’s stay for every 10 nights booked through their website. Make sure to store the number of the 24-hour hotline for your credit and debit cards on your phone. The advantage of using your cards over cash is that if you lose them, you can cancel them to limit your loss. It’s also best to notify your bank of the countries you’ll be visiting and your travel period before you fly so that your card doesn’t get frozen while you’re away. Sometimes the bank security systems mistake your holiday spending for fraud transactions and can freeze your card which can be a very frustrating experience especially if you have only one card. Travel money cards can come in handy for securing bookings with overseas businesses that you’re not quite comfortable giving your credit card details to. Qantas and Virgin frequent flyer members can take advantage of the travel money function on their membership cards with both Qantas Cash and Velocity Global Wallet not charging fees to load money onto it. Download the XE Currency app, available on iPhone and Android, before you fly off. This is one app that I use regularly when I’m travelling and comes in handy for those “what’s that in Australian dollar?” moments when you’re in a shop looking at a price tag in a foreign currency.